Why do I fantasize about Joan Didion? Often in Blue Nights Joan Didion talks of treating her daughter like a doll, like the perfect child. Ultimately this is how I treat Joan herself in my mind. She needs to be perfect. She needs to be Joan Didion, Proper Noun. As far as I’ve read, no one ever writes “Didion-esque” because the thought is ludicrous; the whole point of her celebrity is that there can only be one of her, one against the rest, even when she was in a partnership. And when she dies — have you thought about how you’ll feel when Joan Didion dies? Have you taken a moment to think about how impossible it will be to avoid chatter name-checking the same essays? How often will you be reminded of her aloof response to a reader’s criticism of her piece on Woody Allen’s Manhattan? Or the beginning of “Goodbye to All That”? Or that banal truth,Life changes in an instant? Will it be like when the mourning of Norman Mailer’s passing coincided with the mourning of his symbolism, of a world that allowed young men like Norman to be who he ultimately became? When we read Joan Didion, are we hoping to resurrect a different world, one for women like her? Are we already mourning her? When Joan Didion dies, I will probably be very upset. Like so many other bookish females from California, with an eye on fashion and another on sentences, Joan Didion is my Bruce Springsteen. She was a guidebook detailing exactly how and why she left home and went back and left again, convincing me that I could be exactly like her one day, because I already was like her. We came from the same region, and I was thinking thoughts she had thought and seeing places she had seen. Now that I’m older, I find it harder to go along with her insistence on the dangers of her life, because Malibu is still Malibu, cliff or no cliff, and foreboding weather does not negate the heft of the costs to live there. But I can’t help holding up the physical items in Joan Didion’s life, given such weight by repetition and privilege of place in that Bodoni type. They become as talismanic as she presents them, either by my own lust for her material wealth or by her strengths as a writer. Or both — both exist, surely, and both compel me to read almost every single one of her books. I am saving a few of the fictional works for a moment when I am feeling equally and simultaneously glamorous and despairing, because that’s the mood I have to be in to jump into one of her novels, to submit myself to the point of view of a probably gorgeous woman in an even more gorgeous locale somewhere geo-politically or socioeconomically fascinating for the time. Her non-fiction, though it can be described almost identically, is something I can re-read anytime, no matter how I feel, and I’m not sure why this disconnect occurs. Do I more readily tolerate the undercurrent of vanity in my non-fiction because I’d much rather fantasize about someone I’m told is real? Why do I fantasize about Joan Didion? I’m not alone in doing so. There’s a special group of people who talk excitedly and knowingly about what Joan Didion does and likes and feels, and I am no stranger to that group. I find myself on the street with a friend, talking about seeing Didion read at the Union Square Barnes and Noble, and wishing in vain to give the writer a big hug. “She probably wouldn’t like that,” my friend says, and I agree immediately. She probably would hate it. That “probably” there is what’s exciting about talking about Joan Didion. We feel like we know this person, even though she’s obfuscating and evasive. She “probably” would despise any outward affection, we like to think, because she’s too cool for it. The same hunch that leads to this wrong-headed diagnosis was veritably shaken the first time I heard her giggle nervously while talking to Michael Silverblatt, once I saw her stumble and stutter on an old CSPAN interview from 2000, somewhere between After Henry and Political Fictions, when she used to do things that weren’t related to a book tour. But I still say the “probably” because it’s comforting. She is as much a totem as her tulle, her chiffon, her batiste christening dresses, her fresh lilies in Hawaii, and her fried chicken backstage at the Booth Theater. Her reputation for being unsentimental can be evoked in situations where I feel myself straying from rationale. 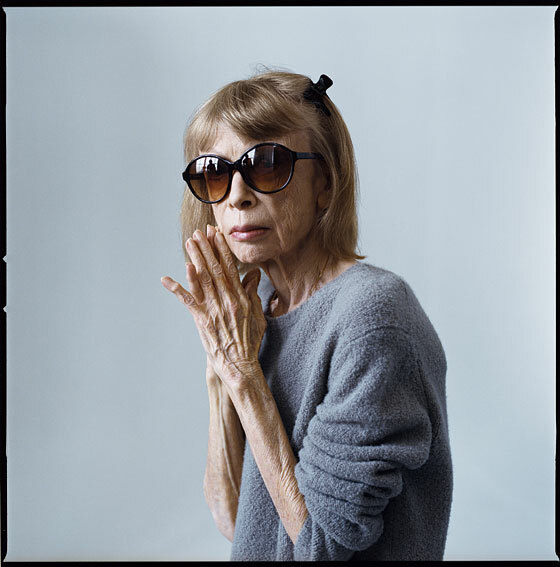 What Would Joan Didion Do? But that’s a misreading, an unfair edit, talking about the fried chicken and excluding the grease on your hands afterward. She’s a person, after all, and even one of her most famous dissections, “Slouching Toward Bethlehem,” ends with a mother’s instinct, a heartbreaking image of a child neglected. If that’s not sentimentality, then I’m not sure of the word anymore. Her work complicates the feeling that you know her. The pictures — of her leaning out of her car with a sideways glance, of her sitting with her family on a Malibu porch — these are easier to take in two dimensions. And even those have been dismantled by Didion herself, in her most recent work. We cannot see pictures of her with John and Quintana without seeing the dramatics of her family story. A sideways glance once conveyed a cool customer and now also show insecurity and obliviousness, a troubled woman that one shouldn’t romanticize, as she is by her own descriptions a bad mother. Fantasies don’t go away as easily as time passes, as quickly as you grow up and kill your idols. And I still fantasize, even though she makes it difficult, about the things she did, even if I no longer want to do them too. I’m still convinced by that Bodoni type. It’s beautiful type. So crisp, so clear. Perfect type for her, this person I think I know.